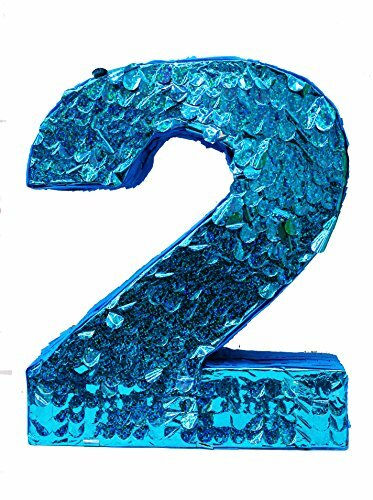 Our shiny large Number Two Pinata is made with sparkling blue holographic paper for a magical effect. This beautiful number pinata is the perfect addition to any girl’s second birthday party and it’s also ideal to build your age in a fun and original way! This pinata measures 24 inches high by 20 inches long by 5 inches deep and can be filled with up to 3lbs of toys and candy (sold separately). You can use this beautiful pinata as centerpiece decoration for your food table or just fill with candy and toys and play the traditional party game!